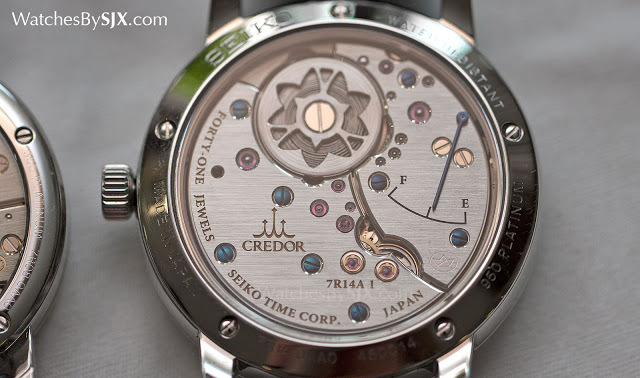 The Japanese equivalent of the Philippe Dufour Simplicity, the Seiko Credor Eichi II was introduced earlier this year, succeeding the first generation model. Both share many similar qualities, outwardly they are nearly identical, but side by side the differences are stark. 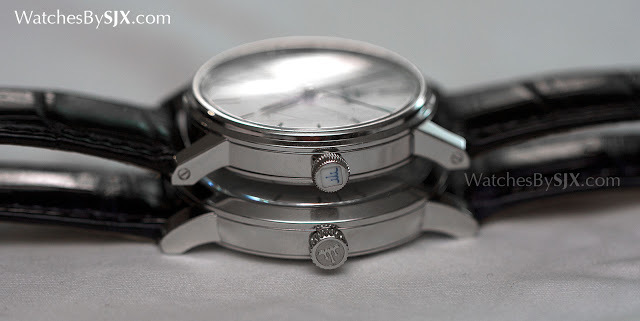 Conceived as a simple wristwatch of the highest quality – Seiko sent watchmakers to study with Dufour to learn his movement finishing techniques – the first generation Eichi was a smallish wristwatch with a 35mm platinum case. The Eichi II is still platinum, but with a more contemporary 39mm diameter. Though the form of the case is similar, the Eichi II case is completely different. Where the Eichi I has a case that is mostly about rounded shapes, the Eichi II is bigger, flatter and cleaner. Instead of a stepped, rounded bezel as found on the Eichi I, which makes it seem smaller, the second generation has a wide, flat bezel, making it seem larger than it is. These details result in a disparity in size that is seems more significant than the 4mm difference in diameter. Beyond the size, the case styling of the Eichi II is also more modern. 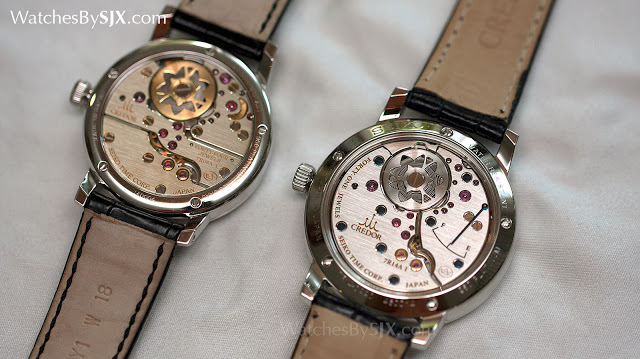 While the case of the Eichi I is reminiscent of a 1950s wristwatch – that was the intention of the designer – the Eichi II is clearly a modern wristwatch. 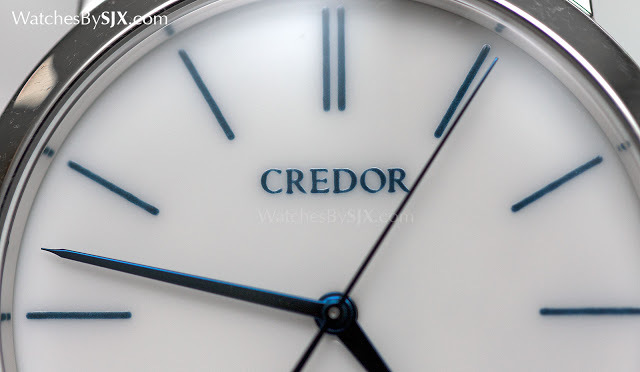 And the Eichi I has a bonus the second generation lacks – the crown has a tiny Noritake porcelain inlay with a hand-painted Credor logo. The Eichi II has a platinum crown with a cast logo, still well made and attractive, but not quite as delicately beautiful as the porcelain insert. The reason for the absence of the porcelain insert is the dial, which was Noritake porcelain in the first generation watch. A Japanese maker of fine bone china that supplies the Japanese Imperial family, Noritake was responsible for the entire porcelain dial, including the hand-painted markings on the dial. Exceptionally fine quality, the porcelain dial is a luminous white with blue markings. 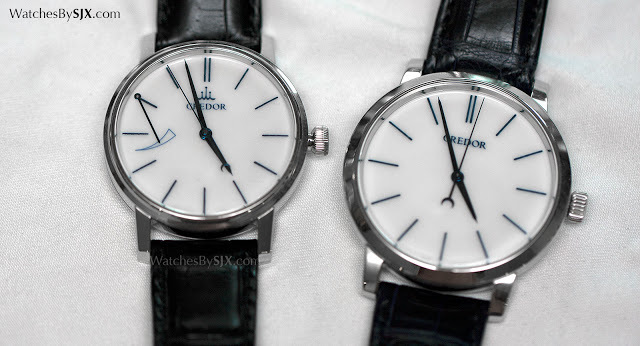 A subtle “2”, “4” and “7” is painted in matte white enamel on the dial, making it visible only at certain angles. This motif is a recurring one in the Credor line-up, being a reference to the hours of a day and the days in a week. And the dial has a minimalist power reserve indicator at 10 o’clock, something that is found on the movement in the second generation. The dial found in the Eichi II, on the other hand, is made by an unidentified porcelain manufacturer in Japan. But more importantly, the contractor only makes the porcelain dial disc. 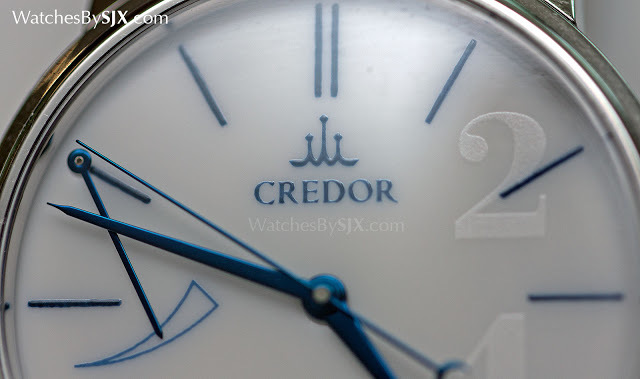 The indices and logo on the dial are hand-painted by a watchmaker at the Micro Artist Studio where such top-end Credor watches are made. It took him a year to master the art of porcelain painting, allowing Seiko to bring at least part of the dial production in-house. There are minute differences between the two generations. 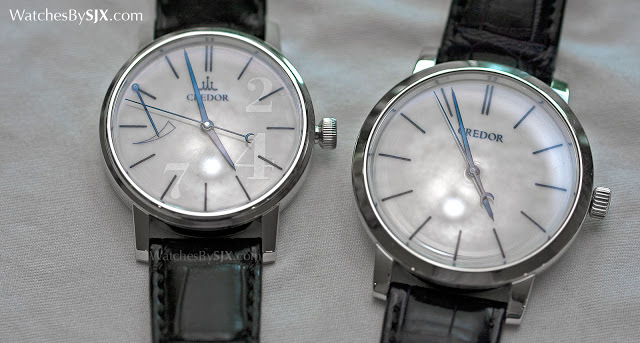 Most obviously the Eichi I has a more complex dial, with more markings and the Credor emblem. The painting on the first generation dial is slightly – incredibly slightly – finer, which is unsurprising given it was made by one of the finest chinaware firms in the world. Upon magnification the lettering on the first generation dial is marginally neater, with better defined lines. The difference is minute enough it’s invisible on the wrist, and even under magnification only a keen eye would spot it. The Eichi II dial has as little as necessary, which suits the cleaner lines of the case well. But I do find the details on the first generation add an appealing nuance. The divergence between the two generations is most pronounced on the back – between the 7R08A in the Eichi I and the 7R14A in the Eichi II. Though both movements have a near identical construction – functionally they are identical – the stylistic difference between the two is obvious. To start with the the Eichi I movement has bridges made of untreated German silver, an alloy that oxidises to a golden patina over time. Because the bridges of the Eichi II bridges are rhodium plated brass, they have a bright silvery tone. The patina that is evident on the first generation movement (which is now four years old), is charming and attractive. 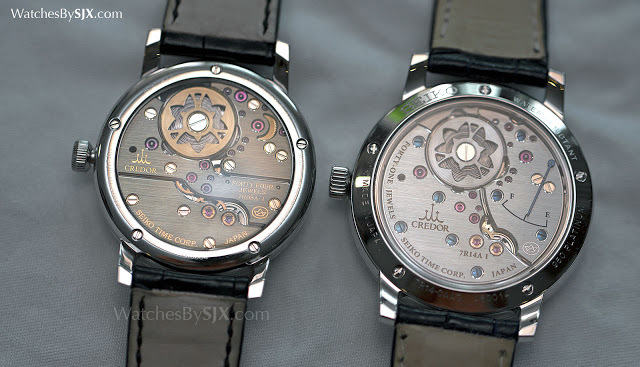 And the look is enhanced by the movement designers’ decision to use several gilded components in the movement, including the barrel and several visible gears. Even the countersinks for the screws are gold plated. Together they give the movement a warm, golden tone. 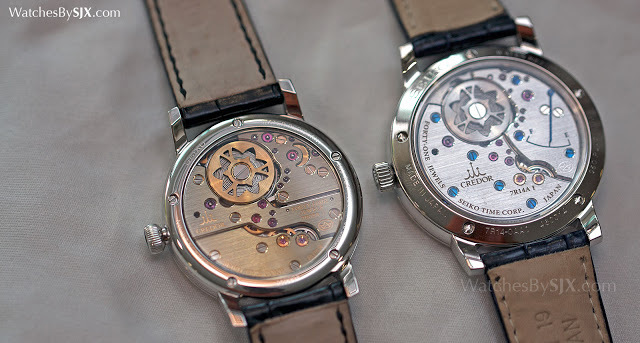 In contrast the Eichi II movement is dominated by cooler colours. Most of the visible components are rhodium plated, while the screws are blued steel. The Eichi II bridge layout is made up of two large bridges, each roughly occupying half the real estate on the rear. Again it is a cleaner, more modern look than that of the Eichi I movement, which has three bridges with a slightly more traditional layout. The point could be made that the Eichi I movement requires slightly more effort to decorate, since there are more bridges. But up close, where it really matters, both movements demonstrates an extraordinary superiority of finishing. But up close there is a distinct difference in the finishing. The treatment of the bevelled edges of the bridges (anglage) is a case in point. In the Eichi II they are wide and polished, uncannily and clinically precise. 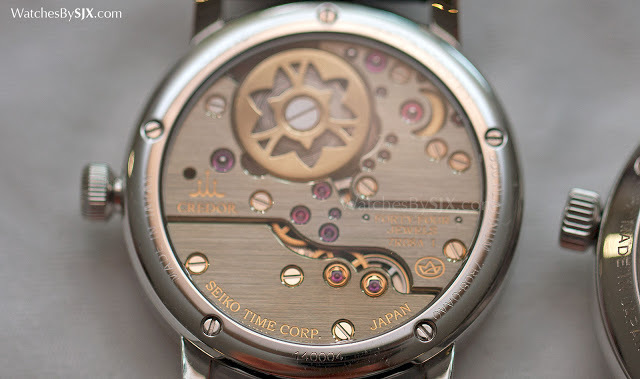 In fact, Seiko notes that the bevelled edges on the Eichi II were designed to be more than twice as wide as those on the Eichi I, so as to show off the finishing more. While in the Eichi I the bevels are narrower, seemingly more modest, they are no less fine or precise. And another difference between the two lies with the buckle: a platinum pin buckle for the Eichi I, while the second generation has a platinum deployant clasp. Only 25 of the Eichi I were made, while the Eichi II is limited to 25 pieces per year, with an unannounced lifespan. Despite the differences, both the Eichi I and II cost exactly the same, ¥5.94 million inclusive of tax. But because Japanese consumption tax rose from 5% to 8%, the Eichi II is effectively marginally cheaper. Correction July 25, 2015: Edited to correct material of bridges (brass) as well as the wider bevels on the movement bridges in the Eichi II.